It's time to turn back to a large scale item, and tonight’s choice is a beauty. The Sideshow Nightcrawler Comiquette was an instant order for me due to my love of the X-Men’s own teleporting fuzzy elf. I had a couple of reservations about the piece from the promo shots, but these all disappeared when I saw this fantastic statue in person. The two things I was worried about were the pose and the scale. In photos, there was something about the pose that looked a tad awkward to me, and it almost seemed as though the head was a little bit too big for the body. Thankfully it all works well and is nicely proportioned in person. The left leg is raised rather high, but a gymnast like Nightcrawler would definitely be limber enough to pull it off. It is an awkward pose when you study it, and Sideshow definitely could have come up with something a tad more graceful, but as a whole the piece still works well. The head size concerns seem to have been a trick of photography, as it works just fine on the shelf. I don’t find it as easy to estimate the scale of a 1:5 piece as I don’t own many of them, so I was wondering how this was going to fit in with my other Sideshow Comiquettes, which are all of the female variety. Particularly, I was hoping this would work with the Rogue and Mystique Comiquettes, and it does quite well. Rogue and Mystique aren't perfectly in scale with each other, but together the three make quite a complimentary set for a X-Dysfunctional Family Diorama. Critique of the chosen pose aside, the sculpting work on this statue is excellent. Nightcrawler’s distinctive hands and feel are perfectly constructed and his musculature is beautifully defined. His tail is long and graceful. This is all complimented by an excellent paint job all around. I’ve never had any paint concerns with Sideshow Comiquettes, and this is no exception. The base of this statue has two components: a stone round at the bottom which is topped by a burst of what is meant to be the brimstone-smelling smoke that Nightcrawler’s teleportation produces. 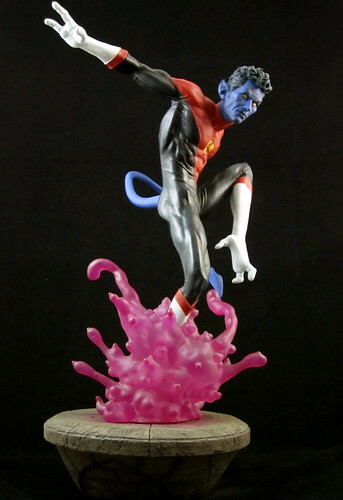 This version looks more like bright pink protoplasm - the smoke effect was captured better in Bowen Designs’ original Nightcrawler full-sized statue. Sideshow’s take on the effect is very visually appealing, but not terribly comic accurate. Still, it achieves the desired result of showing Kurt’s powers at work. This wasn’t a terribly easy statue to assemble for this particular collector. The statue’s right leg doesn’t have a foot, as it’s hidden in the “bamf” cloud, and I had some trouble inserting the leg into the cloud at the correct angle. Eventually we got there. It is pretty stable despite the small circumference of the leg supporting the whole statue, but I don’t know that it would withstand a good bump. Best to abandon any ideas of dancing with this statue, methinks. There is a swap-out portrait option with this piece, which pictures Kurt with shorter hair and a different, fiercer face. It doesn’t look much like “my” Nightcrawler, so the decision making on which to display wasn’t a challenge. The headsculpt of the main portrait still has a serious expression, but somehow it still captures both the playful aspect of Nightcrawler’s personality and it also has his classic mop of curly hair, which is essential Kurt in my book. The short-hair version also makes the statue look a little hunched over to me due to it’s lack of height. The Sideshow Exclusive version of this statue came with a sword to reflect Nightcrawler’s swashbuckling ways. A very nice touch, and as always it’s good to see the exclusive version coming with an extra piece and not just a print, but I don’t know that I would have displayed it, so I was happy with the regular version. One has to be selective with Sideshow’s larger scale pieces thanks to cost and space considerations, but this piece really deserves a place in the collection. If I was on the design time I would have tried to re-toll the pose somewhat and had another look at the teleportation effect, but neither of these issues really detract from my enjoyment of the piece. While Nightcrawler takes his turn on the death merry-go-round in the comics world, I’ll be very content to have this great statue on my shelf for a regular fuzzy elf fix! I think I'd have to see it in person because it still looks awkward to me. But then if Andy likes it I'm inclined to rest on his opinion. Well done Andy, a great acquisition. This isn't a statue I would purchase, but it certainly looks nice. 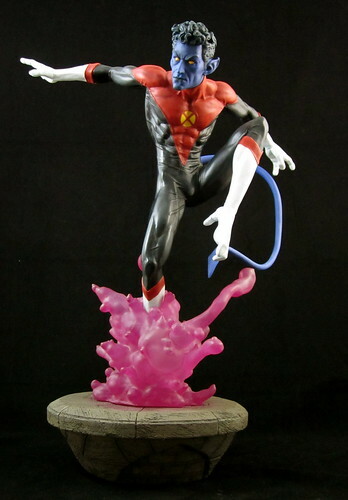 I like the figure itself, but Nightcrawler doesn't really "emerge" from his *bampf*. He really should be in the center of it. But that would probably look like a mess!